For those of you who might have felt a tremor in the force, yes, I was gone for a week on an epic hiking trip. I explored and recreated, and accomplished all of my outdoor camping, hiking, and photographic goals. Watch this space or our trip report blog, The Traveller, for a complete trip report coming soon! 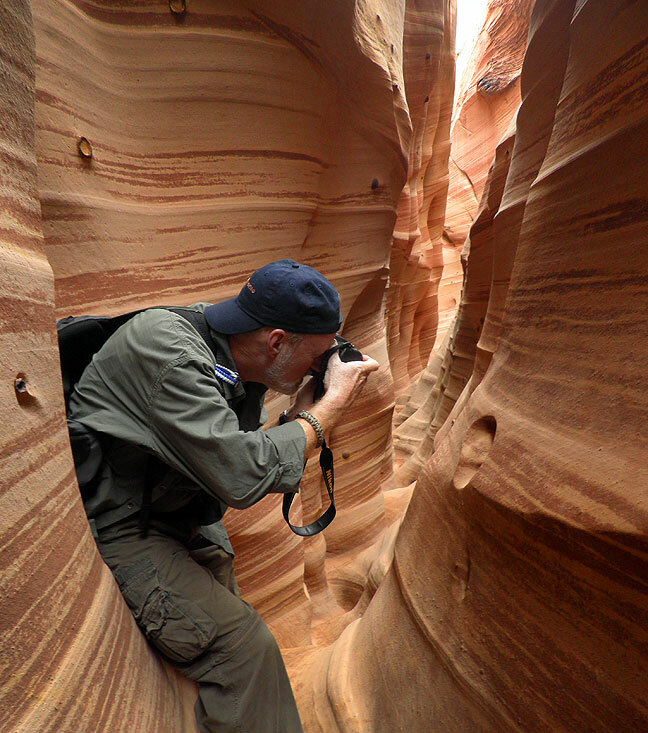 A nice couple, Martha and Gray from San Francisco, made this image of me in Zebra Slot Canyon in the Grand Staircase/Escalante National Monument this week, It was one of my top tier items to photograph, and was everything I hoped. I *thought* I felt a disturbance in the force. I wish I could’ve played hooky and spent the week down that-a-way. I still hope there’s a meet-in-the-middle New Mexico trip in my future…one of these years. Are those perfectly round hole things natural or man made? The whole slot canyon is ‘tastes great’, the holes are the ‘less filling’ part.